Are your retirement funds with TIAA-CREF? If so, please sign Jewish Voice for Peace's petition urging this financial services giant to stop investing in companies that profit from the illegal Israeli occupation of Palestinian lands. And if not, please sign it anyway. More than 19,000 people already have, including yours truly. You can find all the details you need at this link. I have a fantasy. I am fantasizing that the reason the government of Bahrain has withdrawn its troops from Pearl Square in the capital, Manama, is because President Barack Obama called the monarchists who run that country and said the following: You are using our guns and tanks to kill people; stop doing it or we will send in our own troops stationed nearby and take those weapons away from you. 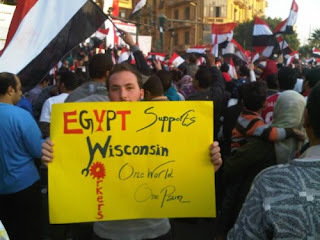 During the protest movements to overthrow President Hosni Mubarak of Egypt, I had a similar fantasy. I fantasized that President Barack Obama had called that nation's military leaders and said the following: We give you $1.3 billion in military aid each year, don't use those weapons against the people in Tahrir Square or we will cut you off. Of course, as some people who know me might say, I sometimes live in a fantasy world. Yet it does seem that the above fantasies might have a grain of truth to them, or at least one can hope so. But for them to be true, it would have been necessary for Barack Obama to muster up a bit of courage. So when the U.S. vetoed a U.N. Security Council resolution condemning Israeli settlements--making it the only one of 15 countries that voted against the resolution, with no abstentions--it really brought me down to earth. Because it reminded me that Obama does not have the courage to do such things, and that his entire presidency has become one based on fear and loathing in the bowels of the White House. Washington's controversial move clearly riled other members of the security council. Britain, France and Germany put out a joint statement in which they explained they had voted for the resolution "because our views on settlements, including east Jerusalem, are clear: they are illegal under international law, an obstacle to peace, and constitute a threat to a two-state solution. All settlement activity, including in east Jerusalem, should cease immediately." William Hague said he understood Israeli concern for security, but said that was precisely why Britain had backed the resolution. "We believe that Israel's security and the realisation of the Palestinians' right to statehood are not opposing goals. On the contrary, they are intimately intertwined objectives." The US has used its veto 10 times since 2000, nine of which involved backing the Israeli side in the Israeli-Palestinian conflict. In other words, it was the judgement of 14 other countries that the U.S. analysis of what was best for the "peace process" was wrong. Under such circumstances, one might expect that the United States would step aside and simply abstain--if, that is, the Obama administration was being honest about its true motives. But of course it wasn't being honest. Don't we all know that the U.S. voted the way it did because it is afraid of a backlash from Jewish voters, from Republican and Democratic politicians who are also afraid of Jewish voters, afraid of what Sarah Palin would say, what the Tea Party would say, what Rush Limbaugh would say? Indeed, the White House is pretty much running scared these days, consumed with its own fears and turning them into American domestic and foreign policy. This is why, for example, Obama waited until the Egyptian people had already overthrown Mubarak before he came out and said it was a good and historic thing. So, for now at least, I guess I will just have to live with my fantasies. But, as John Lennon wrote, "I'm not the only one" to have them. And some day, that will make all the difference. Sunday update: As far as I can tell, the New York Times and other major media carry little or no analysis or followup to the U.S. veto story, despite its far-reaching consequences--consequences that will not be happy for the Obama administration nor for Israel. Nevertheless, Haaretz reports that the Palestinians are considering invoking U.N. rules that would allow it to bring the resolution to the General Assembly within 24 hours. Stay tuned. I don't post often about the AIDS denialist movement--those who argue that HIV does not cause AIDS--but a particularly egregious example of the dishonesty of some of its practitioners came across my desk today. 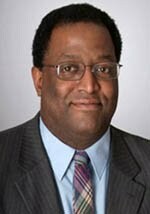 Curtis Cost, author of "Vaccines Are Dangerous" and an associated blog, demonstrated his ignorance of the HIV field by posting an item about a 1997 study by Nancy Padian, an AIDS researcher at the University of California, San Francisco. The title of Cost's post is "Dr. Nancy Padian Study Proves HIV Is Not Sexually Transmitted." You have to read the post, and the paper (which can be found at this link on Cost's blog), to see how fully and totally Cost misrepresents it. In fact, the study comes to the exact opposite conclusion, and also provides evidence that condoms are very effective in preventing HIV transmission. Indeed, mis-citing the Padian paper is apparently a common scam by AIDS denialists too dishonest to use actual scientific arguments for their case. And Cost, who claims to be concerned about the effects that vaccines and AIDS tests have on the African-American community, actually poses a serious danger to that community by misrepresenting Padian's work to argue that heterosexual transmission of HIV is some kind of myth--thus by implication discouraging the use of condoms and other protections. The AIDS denialists can't win on the science, so they use lies. Thus it has been from the beginning of the AIDS denialist movement, thus it continues today. With the help of the U.S. and the Gulf Cooperation Council (GCC), Bahrain has made significant efforts to upgrade its defense systems and modernize its armed forces over the last 20 years. In 1982, the GCC gave Bahrain $1.7 billion for this purpose. Since the 1991 Gulf War, the U.S. has provided military and defense technical assistance and training to Bahrain from Foreign Military Sales (FMS), commercial sources, excess defense article sales (EDA) and under the International Military and Education Training (IMET) program. The U.S. Office of Military Cooperation in Bahrain is attached to the U.S. Embassy and manages the security assistance mission. U.S. military sales to Bahrain since 2000 total $1.4 billion. Principal U.S. military systems acquired by the BDF include eight Apache helicopters, 54 M60A3 tanks, 22 F-16C/D aircraft, 51 Cobra helicopters, 9 MLRS Launchers (with ATACMS), 20 M109A5 Howitzers, 1 Avenger AD system, and the TPS-59 radar system. Bahrain has received $195 million in FMF and $410 million in U.S. EDA acquisition value delivered since the U.S.-Bahraini program began in 1993. The Bahrain Defense Force also placed orders for 9 UH-60M Blackhawk helicopters and 2 Mk-V Fast Patrol Boats. Delivery of both systems was planned for 2009. 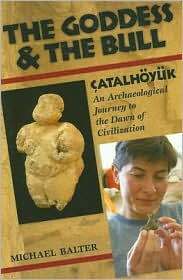 CHEDDAR GORGE, UNITED KINGDOM—How do you make a drinking cup out of a human skull? It's fairly easy if you have some sharp tools—and a strong stomach. Scalp the head; remove the ears, eyes, lower jaw, and other pesky parts; and buff the jagged edges. Voilà! You've got a skull cup fit to toast your friends or your enemies. The Obama administration, led by Secretary of State Hillary Clinton, has been telling us for days that Egyptian President Hosni Mubarak shouldn't be forced to resign right now. Why? Because according to the Egyptian constitution, elections would have to be held within 60 days, and that's too soon for free and fair elections to be organized. In other words, perhaps without realizing it, the administration is echoing Egyptian Vice-President Omar Suleiman's comments that his fellow citizens are not yet ready for democracy. 1.) Follow the constitution and wind up with the regime handpicking a successor after 60 days for a full presidential term. That hardly resolves anything. The procedures are written in such a way that Sulayman could be nominated, but it would break the promise both Mubarak and Sulayman made for constitutional reform. This procedure would not even put lipstick on the regime's current face. 2.) Follow the constitution with the promise that the new president (presumably Sulayman) pick up the constitutional reform process. That puts the crisis on hold for 60 days and offers the opposition promises for reform that might be redeemed later -- and might not be. This would put lipstick on, but not much else, particularly given the toxic lack of trust in the regime's promises. 3.) Suspend the constitution and negotiate a transition between the current regime leaders and the opposition. And then we are in regime change territory, operating outside the existing rules. If the process were successful, it would not produce merely a reconfigured regime but would be moving toward a different kind of political system. The opposition has made clear that it wants such an outcome, but it has not sketched out any vision in detail. The negotiations over transition would be difficult and confusing, demanding that the opposition transform its negative platform (Mubarak must leave) into a positive one. If Mubarak resigned today, the third option is the only one that offers anything like real political change. It may be the best outcome and it is what the opposition is effectively demanding. It may very well deserve our support, but we should know that when we call for Mubarak to step down, then legally at least this is where we are effectively pushing." Update: A paragraph from a New York Times story today by David Kirkpatrick, reporting that the pro-democracy movement is gaining strength as labor unions go out on strike: As reports filtered in of strikes and unrest spreading to other parts of the city and the country, the government seemed to dig in deeper. Mr. Mubarak’s handpicked successor, Vice President Omar Suleiman, warned Tuesday that the only alternative to constitutional talks was a “coup” and added: “We don’t want to deal with Egyptian society with police tools.” In other words, Suleiman is threatening a bloodbath if the movement does not disband. This is the man that Obama and Clinton want Egyptians to trust to make the transition to democracy? Fortunately, the movement is so strong now that Mubarak and Suleiman will soon be swept aside, and American diplomacy will be left empty-handed. The Middle East doesn't need stability. So argues the always excellent Gideon Levy, in Haaretz. An excerpt: Indeed, that stability should be undermined. The stability in the region, something which Westerners and Israeli have come to yearn, merely means perpetuating the status quo. That situation might be good for Israel and the West, but it is very bad for the millions of people who have had to pay the price. Maintaining Mideast stability means perpetuating the intolerable situation by which some 2.5 million Palestinians exist without any rights under the heel of Israeli rule; and another few million Palestinian refugees from the war of 1948 are living in camps in Arab countries, where they also lack any rights, hope, livelihood and dignity. This so-called stability encompasses millions of Arabs living under criminal regimes and evil tyrannies. In stable Saudi Arabia, the women are regarded as the lowest of the low; in stable Syria, any sign of opposition is repressed; in stable Jordan and Morocco, the apple of the eye of the West and Israel, people are frightened to utter a word of criticism against their kings, even in casual coffee-shop conversations. Please read it all. 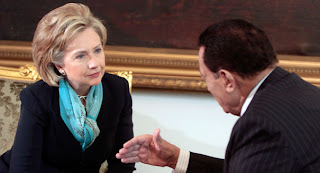 Every day that President Barack Obama and Secretary of State Hillary Clinton fail or refuse to back the demand of Egypt's pro-democracy movement that Hosni Mubarak resign from office immediately, they are emboldening the regime and endangering the lives of the courageous demonstrators. No one knows how this is all going to end, but trusting a dictatorship to build democracy is like trusting the fox to do community organizing amongst the hens. The reasons for their waffling are many, but it apparently all boils down to concerns over "stability"--a euphemism for fears that Egyptians will decide themselves who their leaders are going to be rather than being content with yet another dictatorial or authoritarian regime sympathetic to U.S. and Israeli interests. I would like to think that Barack Obama knows better in his heart, so what is his abject cowardice in the face of these historical events based on? Fear of what Sarah Palin might say if the Muslim Brotherhood gets to play a role in the new government? Fear that he might lose his bid for re-election if the right-wing could claim that he "lost" Egypt? Whatever the case, if the government cracks down on the movement, which they will indeed do if it falters for lack of international support, Obama and Clinton will have blood on their hands. Come to think of it, they already do, since until the pro-democracy movement began they were content to simply continue decades of U.S. support for the Mubarak regime. PS--Oh, believe it or not, presidents can resign. Remember Richard Nixon? Update: If the Obama administration (and the Egyptian government) were hoping that the protests would run out of steam, no such luck. 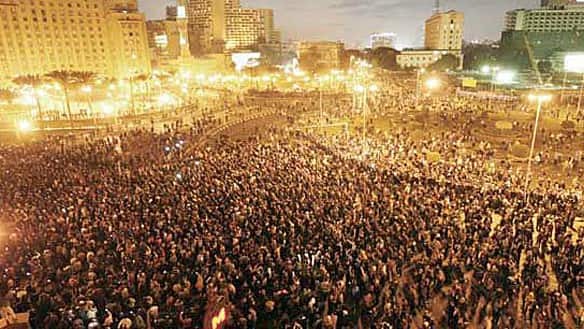 Today's demonstrations in Tahrir Square were reportedly the largest yet in the two week long movement. One of the most important organizations fighting against the Israeli occupation of Palestinian lands, Jewish Voice for Peace, finally got the recognition it deserved from the New York Times the other day, in an article entitled "A Jewish Group Makes Waves, Locally and Abroad," by Daniel Ming and Aaron Glantz. As a sometimes advocacy journalist, especially where political issues are involved, I am proud to be a member of JVP's New York chapter. The video above is a montage from JVP's December 10 nation-wide events in furtherance of its campaign to get TIAA-CREF to divest its pension funds from corporations involved in the Israeli occupation--most notably Caterpillar, which provides most of the bulldozers used to destroy Palestinian homes and other buildings. By the way, although JVP is made up mostly of Jews fed up with Israeli policies, non-Jews are most definitely welcome in the organization. I hope you will consider joining. Is democracy in Egypt good for the Jews? One of the more amusing aspects of the revolution in Egypt is the reaction in Israel. While most of the world is rejoicing over the impending overthrow of a brutal, authoritarian regime, Israelis are loudly nervous about what could come next--so much so that one can't help concluding Israel would much prefer the status quo. 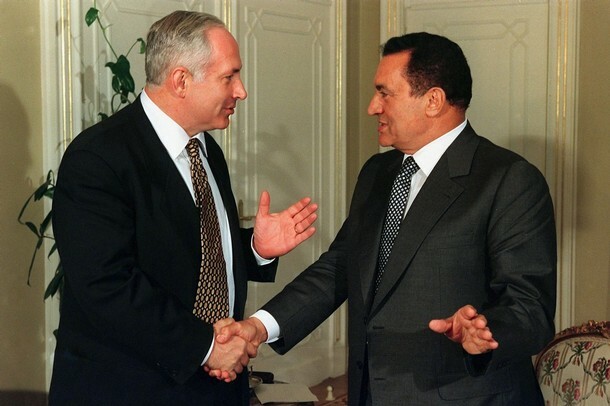 Israeli Prime Minister Benjamin Netanyahu (pictured at right with Egyptian President Hosni Mubarak) has expressed his fears that Islamic extremists, such as the Muslim Brotherhood, could come to power, thus ending the cosy relationship between Egypt and Israel. This relationship has kept U.S. military aid ($1.5 billion/year) pouring into Egypt and has been pivotal in keeping the people of Gaza under lock and key. ISRAELIS want to rejoice over the outbreak of protests in Egypt’s city squares. They want to believe that this is the Arab world’s 1989 moment. Perhaps, they say, the poisonous reflex of blaming the Jewish state for the Middle East’s ills will be replaced by an honest self-assessment. But the rest of the piece tells us that this is very unlikely to happen, and that a takeover by the Muslim Brotherhood is pretty much a foregone conclusion. Of course, this might be wishful thinking on the part of many Israelis, and certainly Israeli leaders, because if Egypt became a democracy--or at least more democratic--Israel would be denied one more excuse not to make peace with the Palestinians and give them back their stolen land. As things stand now, there is no real reason to think that the Muslim Brotherhood will become the dominant power in Egypt. But if does, it will be thanks in large part to the Israeli and American direct support for Mubarak's suppression of democratic forces all these years, and Mubarak's tolerance of and complicity with Israeli policies. One would think that Israelis would be smart enough now to embrace the revolution underway in Egypt, in hopes that their support of the Egyptian people at this historic moment might pay dividends down the line. Some Israelis are that smart, but they are not to be found among the nation's leaders nor among its apologists. Update: Tom Friedman also cautions Israel about its misguided attitudes in a Times op-ed piece today. I like his conclusion: "There is a huge storm coming, Israel. Get out of the way." Sane voices in Israel: As I said above, they can't be found among the country's leaders, but as usual they are featured in the excellent Israeli newspaper Haaretz. Commentator Anshel Pfeffer asks why Israel should be the only democracy in the Middle East and chastises the fear mongers; Amira Hass writes about what she calls the "collective tyranny of Israeli Jews... over the Palestinians." Is U.S.-Israeli dominance in the Middle East over? So says William Pfaff in a Truthdig post. Who is Omar Suleiman? Jane Mayer of the New Yorker tells us. In short, he was the man who helped the C.I.A engage in "renditions" of terrorist suspects who were then tortured in Egyptian jails.